Care to be Different > Articles > NHS Continuing Healthcare > Still living at home? Some home adaptations and mobility equipment may be available free of charge. It’s always worth asking. Gov.uk has a lot of other additional information, too. Talk to Social Services AND to your GP. Make sure the focus remains firmly on your health needs first and foremost – not on how much money you have. Your GP may assume that it’s a matter wholly for Social Services, but if you have health needs, the NHS needs to be involved. At some point you may be eligible for NHS Continuing Healthcare funding. If you feel you can no longer stay in your current home, you may not necessarily have to move into a care home. You may be able to find sheltered housing locally – or perhaps move into a care ‘village’ or retirement village, such as those run by ExtraCare. Another option that requires a great deal of careful thought is to have a family member move in with you at home (or vice versa). This is a big step for all concerned and it’s a good idea to take financial advice before you do it, as it could affect your benefits and other aspects of your entitlement to care. This 39-page practical guide helps you ask the right questions, understand how care fees work and make a better decision. You’ll save time now – and avoid unnecessary care costs later. It also gives you a helpful introduction to care fees and fully-funded NHS care. 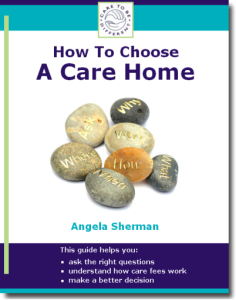 Read more about How To Choose A Care Home. I’m preparing for a Decision Support Tool/Multidisciplinary Team meeting on Monday and I’m really confused about the role of District Nurses if my mum loses her case for NHS Continuing Healthcare (CHC) funding (which in a self fulfilling prophecy all the people involved in making the recommendation say will be the case). Our local district nurses are part of an Integrated Care Team employed by the NHS. My mum relied on this team and a self employed carer and family support before she went into hospital. We hope that she can come home, but her health and well being deteriorated terribly in the six months before she went into hospital, even with continuous visits from the Integrated Care Team. The hospital social worker said even if mum didn’t get CHC she would be looked after by the integrated care team. But surely that is NHS care – not local authority? And in that case surely that spells CHC? Hi Pam – If a person needs care at home, there is still the same requirement for a Continuing Healthcare (CHC) assessment to be carried out if there is any likelihood the person may be eligible. This should happen before anyone starts talking about money and paying. If you’ve already looked at the Checklist and decided that it’s very unlikely the person would get through the CHC assessment process (http://caretobedifferent.co.uk/how-do-you-know-if-a-continuing-healthcare-assessment-should-be-done/) – or if a person has had a CHC assessment and has been found ineligible – then this is the point at which means testing comes in. If the person’s funds are below £23,250, the local authority will need to make a contribution to the costs of care; the person’s income will still be taken into account, though (income, as opposed to savings or assets). This page on the AgeUK website may help: http://www.ageuk.org.uk/home-and-care/help-at-home/paying-for-care-and-support-at-home/ Take a look at the downloads at the bottom of that page, too. Regarding respite, this may also help: http://www.ageuk.org.uk/home-and-care/advice-for-carers/having-a-break/ Again, there are some downloads at the bottom of that page. My sister was in hospital for 2 years she has suffered a great deal, she came home in November n my mother has been caring for her alongside a career who comes in 4 times a day for ten minutes. My mother is 66 and cannot physically, mentally or emotionally take are of my sister. She needs 24 hour care in her home. Can you please advise me on what do we have no idea or any support. Thank you very much.